This past Sunday I had a 1,500 point Dropzone Commander game of Careful Advance against Andrew Fitzgerald’s beautifully painted Shaltari. Andrew is Major Awesome on the Hawk Forum, and he used to be a regular opponent of mine, but our life situations changed as well as our LGS situation, and it’s been difficult to get games in with him this year. But the wife was out of town last weekend, so I was able to make the long trek to Imperial Outpost Games in Glendale, AZ, and throw down with Major Awesome! Careful Advance is one of the new missions from Reconquest: Phase 2, and features corner deployment areas, 3 objectives in large buildings along a central diagonal line between these deployment areas, and two Critical Locations, one in the center of each of the table quarters that the deployment areas are not in. So, basically, just like Secure the Flanks, only with CLs instead of Focal Points. This has become my go-to list. This would be my first time facing a Panther, and I was eagerly anticipating it. 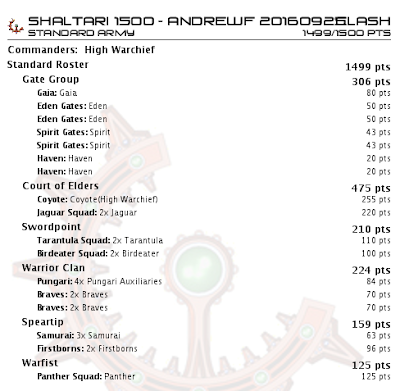 There’s been a lively debate on the Hawk Forum about the Panther, mostly by Shaltari players, as it’s in the Shaltari Forum, but I lurk everywhere and have injected my 2 cents into the discussion, of course. I maintain that the Panther is just a little too good, that it has just one too many top shelf features, despite its hefty 125 points price tag. Andrew and another friend, James Winnett, who also plays Shaltari, have gotten a few games in with, or against, Andrew’s Panther(s), and contend that it is just “meh”, and rather underwhelming. I had decided a while ago that I needed to get in at least a few games against at least one of these newfangled infinite range AA beasts before I opined any further on the subject, but it’s been difficult syncing up with Andrew’s schedule. But I finally got to pop that cherry, and my first game vs a Panther is now in the books. It’s been 3 days since the game, and a few details might be fuzzy, but I’ll do my best to give you a Turn-by-Turn recap. I won the Initiative roll, and opted to go second. Andrew led off (either first or second activation, can’t recall) by walking his Panther on right in the crook of the corner of his corner of the board. It was mostly blocked by the Large buildings in the central diagonal line between us (tall, then rectangular in the center, then tall), but it still had several clean lines of fire into my DZ, or just beyond it where some of my dropships might (and did) want to go, so the game was afoot! I moved my Njord to the right towards the CL in that direction, knowing that I wouldn’t get my Type-1’s onto it until Turn 3, but that was the best direction for them to go – Andrew had placed a good deal of scatter terrain and trees in the vicinity of the CL to my left, which would hinder both of us, but I decided that trying to put the Njord over there and deploying the Phobos and Menchits in that area would not be a good idea, so I headed to the right and kept the big assault gunship To The Deck behind a Normal building and out of Line of Sight to the nasty Panther. I therefore wanted to put my Helios (and Erebos) towards the other CL, but if I headed straight for it Andrew’s Panther would’ve had a clear shot at their Neptune, so I was forced to place the Helios’ Neptune, and the Erebos’ Neptune, more towards the center building to take cover from it. This result of having to stay out of sight of the Panther on Turn 1 was the first of many effects that it had on the outcome of the game. 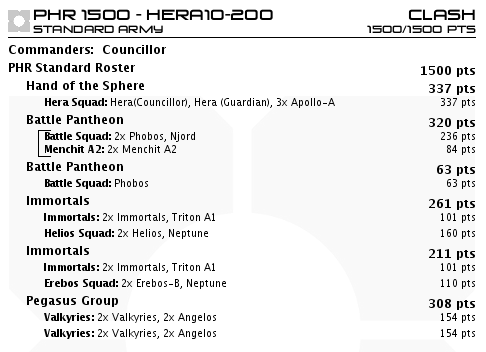 To finish off the turn I ended up getting both of my Immortals squads into my home objective building, while the Valkyries’ Angelos drove on in pairs, one to each side of my home objective building so that they could target the central building. (Central? Yes, central.) Since my home objective building was (correctly) 12” away from my corner board edges, the Girls couldn’t make it into that structure this turn, so one squad holed up in a Normal sized building to my left, while the other squad camped on the ground in the shadow of a Small building to my right, awaiting Turn 2 when they could all join the Immortals to search for my home objective. My Hera blob walked on from the left, but couldn’t make it very far due to the Normal sized, rectangular building that the one squad of Valks were in, which was halfway along the top of my left board edge in my corner. The Hera and her cohorts were intended to make it over to the CL on my left. My walk on Phobos walked on the only place it could that made sense, off to the right along my right board edge. Andrew, in the meantime, put his Pungari and Braves into his home objective building, moved his Gaia and an Eden towards my left, deployed his Birdeaters over there behind a structure, and dropped his command battlegroup heading towards the CL on my left as well. It was clear that Andrew was making a move towards that CL, with very little of his Units (nothing, really) heading towards the CL on my right, but I'm wise to the ways of the hedgehogs, so I kept an eye on things over there. He kept the other Eden back near his Panther, and dropped the Samurai near the central objective building out of a Spirit gate. A couple of things to note here: First, with four search rolls coming up in Turn 2, there was a really good chance that Andrew would find his home objective straight away, and if not, then in Turn 3, so I decided to concentrate my demo firepower on the central objective building in the hopes that I could persuade Andrew not to try for that objective. If I could deny him that objective, and if I couldn’t get it myself, then it would come down to who could score the most on the two CLs. I think Andrew won the roll off for Turn 2, but I can’t be certain. It wasn’t crucial that either of us went first, so it doesn’t really matter. 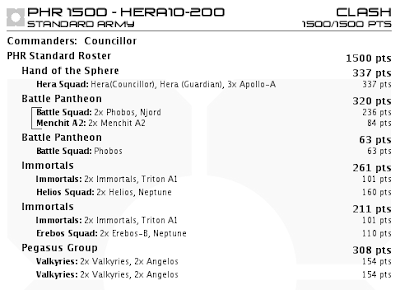 What does matter is what I did with my Neptunes that were lingering near the center of the table with my Erebos and precious Helios on board, and whether or not my Njord would make it over to the right CL with the Type-1’s without getting Pantherized. As it turned out, Andrew wasn’t interested in trying to hurt the Njord, so eventually I had to make a move with my Erebos and Helios, and try to get to the CL on my left. It was clear that Andrew wasn’t going to be able to get anything over there to try to score on it this turn, so anything I could’ve gotten there by the end of this turn would have garnered me a precious VP. I decided to activate my Erebos first to see if Andrew would shoot at their Neptune with his Panther, which had shimmied over to have an even better shot between his home building and the central objective building, a corridor that both of my Neptunes would need to pass through in order to reach the CL on my left. Andrew opted not to reaction fire on the Erebos’ Neptune with his Panther, and his Birdeaters were out of LoS behind a Normal sized building closer to the center line of the board, so the Erebos made it safely to my left… But ended up just half an inch too far away from the CL over there to score on it! Arrrrgghh!!! And now, with the Erebos squeezed between a Small building there and a patch of trees, there was no way that my Helios would be able to get over to that CL this turn, either (and, they were really just too far away, as their Neptune was further away from that CL than the Erebos’ Neptune had been, by just the width of a large flight stand, as my two medium dropships were snuggled up against each other after they came onto the board Turn 1). So, it came time to move my Helios’ Neptune and deploy the Helios. I considered moving their Neptune in the direction towards Andrew’s corner and deploying the Helios behind the Large central objective building, where they would have been safe, but would not have been able to contribute their points towards that CL on my left on Turn 3. So, I decided to gamble and jump the Neptune across the gap that the Panther was staring through. This time, Andrew decided, “Why not?”, and reaction fired on my Helios’ Neptune with his Panther. He rolled 5, 6, 6 To Hit. E8 vs A6, he needed just 3+’s to damage on each die, and a 5+ on any of the dice would inflict 2 DPs to the hapless Neptune. I can’t remember his exact Damage roll, but he ended up doing at least 5 DPs worth of damage to that poor Neptune with his accursed Panther! “That’s the first time it’s actually done anything!”, exclaimed Andrew. Great, thought I. Wonderful. Glad it finally did something for you. Joy. So, now to see what happened to the Neptune. I held my breath. Andrew rolled a 5, so a Wreck, and a 50/50 chance for each Helios to survive it. Andrew proceeded to roll double 4’s for the Helios. And just like that, I had zero AA on the left half of the board, and no way to get any over there. Meanwhile, my Immortals could not find my home objective, the Valkyries jumped in to help them out next turn, and I unloaded on the central objective building bringing it down to 15 DPs (from our standard 30). Andrew, on the other hand, found his home objective with his massive number of dice he was able to roll to look for it, and managed to just be able to get his squad of Pungari into the Normal sized building that was nestled up against the CL to my right, because, Gate Shenanigans! So, I deployed my Menchits just out of reach of that CL, but right in front of that building the little ankle-biters were giggling in, and moved my Phobos pair more towards the center of the table. They wouldn’t be able to contribute towards scoring on that CL by going that way due to a Small building that was connected in an “L” configuration to the Normal building the Pungari were in, but I could bunny-hop them over there with the Njord if I needed to in a later turn. My walk-on Phobos, meanwhile, made it onto a roadway in preparation to make a run for it up the road the next turn, and shot at the central building for the hell of it, and contributed to its increasingly dilapidated state of existence. And really, that's what I wanted to find out, and I'm actually not surprised that it did that. Even if it only hit on a 6 with reaction fire, it would've destroyed the Neptune, given how Andrew rolled. Great read! It would be nice to see a picture of the battlefield, becouse for someone like me its hard to picture the battlefield as i dont play that often.